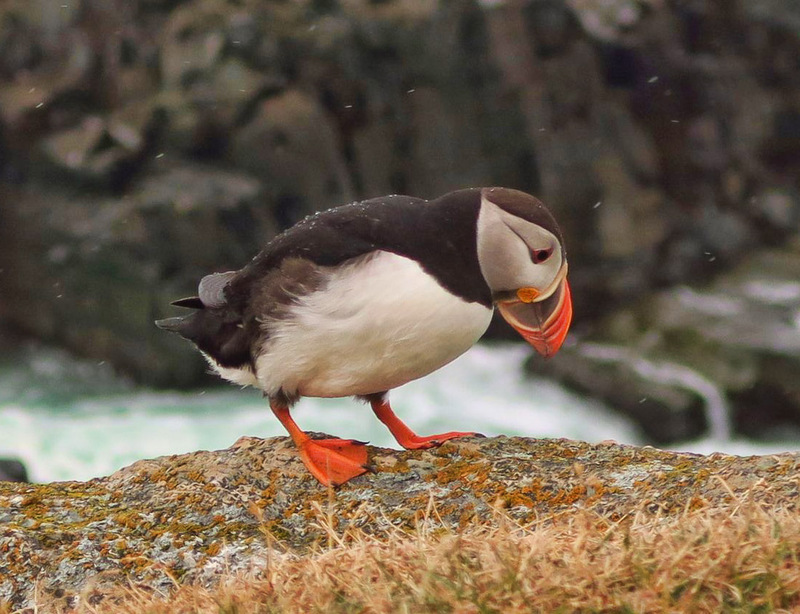 The chance to see a puffin up close is haunting me, particularly after reading in the Newfoundland Travel Guide that it’s one of the only remaining places in the world where one can see them up close in the wild. 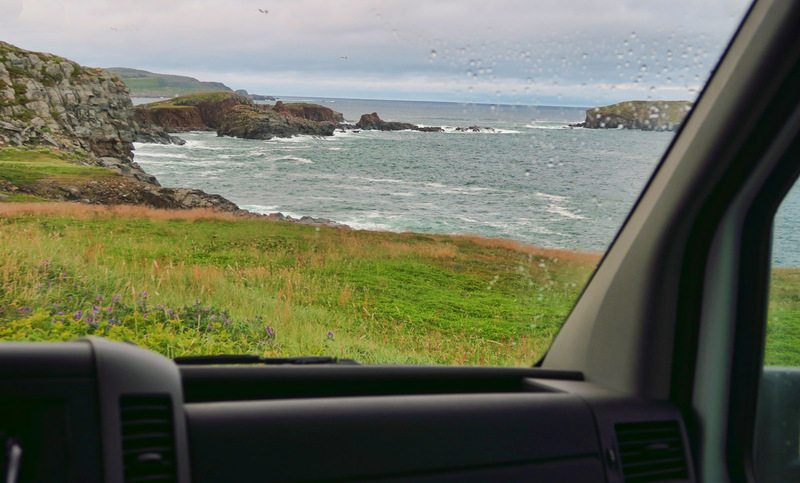 But it means a 30 mile drive back to Elliston in the rain, and still no guarantee. However, the weekend is now behind me, so crowds should have let up. I decide I will boondock at the scenic overlook just beyond the puffin site. This will give me two opportunities, one later in the evening, and another the following morning if I don’t have success. Boondocked at the overlook on Maberly Road. I take my seat on the rock in the flight path, but it’s the same scenario as before. It’s like rush hour at Atlanta Hartsfield Airport as they take off from the island. 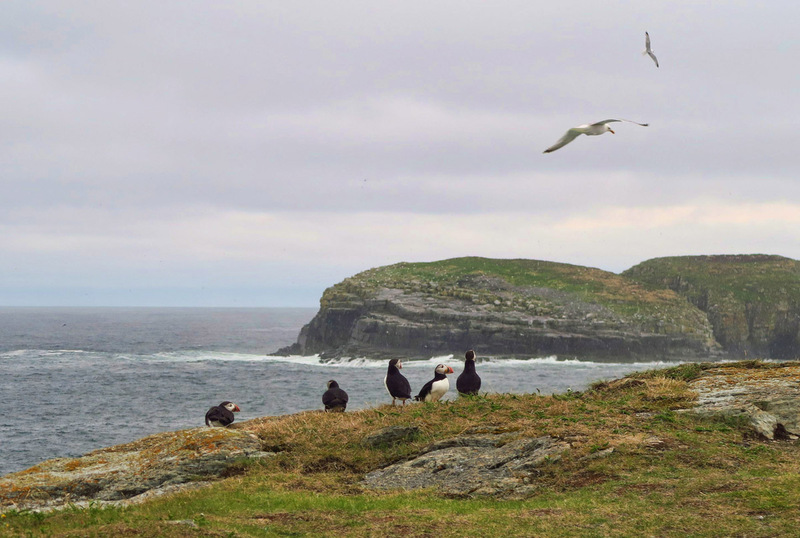 They fly toward me, but at the last minute, pull up and circle around the rocky islands to my right, dive-bombing the ocean surface, then return to their private island. Over and over again, I sit still as a statue, watching. Until, PLOP! Out of the sky, one clumsily lands within a few feet of me! Afraid to flinch, lest I scare them off, I slowly reach into my pocket for my camera. Then another! And another! 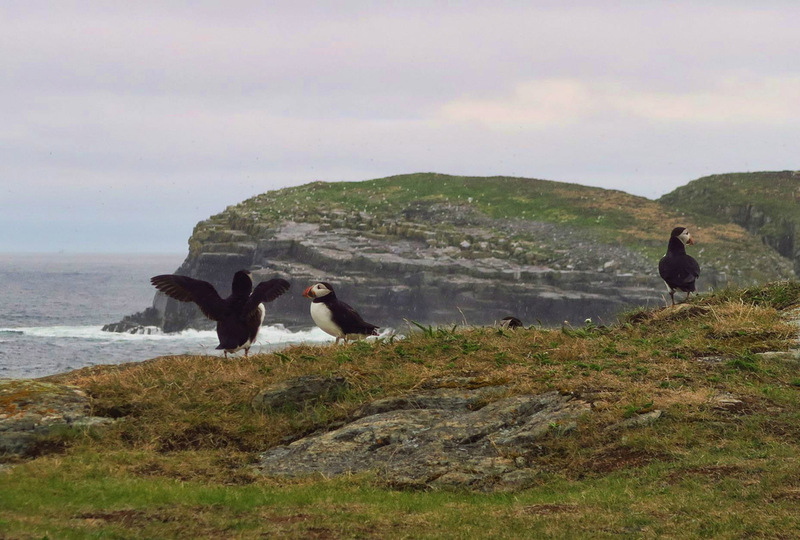 Until I am snapping like the puffin paparazzi. Within a couple of minutes, a second one follows. They come in for a landing more like a novice skydiver. The most at one time was five. The remaining half a dozen people have now left, satisfied with their close-ups magnified with their monstrous telephoto lenses. But my camera doesn’t do well with the zoom in low light. I want to go closer. I look around, and there is only one other young woman left out on the end of the promontory, and she is in the same boat as me…trying to photograph with a point and shoot. We signal each other that we would both like to encroach. Not wanting to foul up her photo shoot, I whisper to her “I will if you will.” We agree to a strategy…Get down low, move in, and shoot. We will inch forward little by little, pausing to shoot before moving in further. It’s tough not to laugh at the image of the two strangers huddled together, crouched down, advancing in a unified front. I’m not sure what’s happening here, but a little spray is coming from his mouth…like he is spitting? 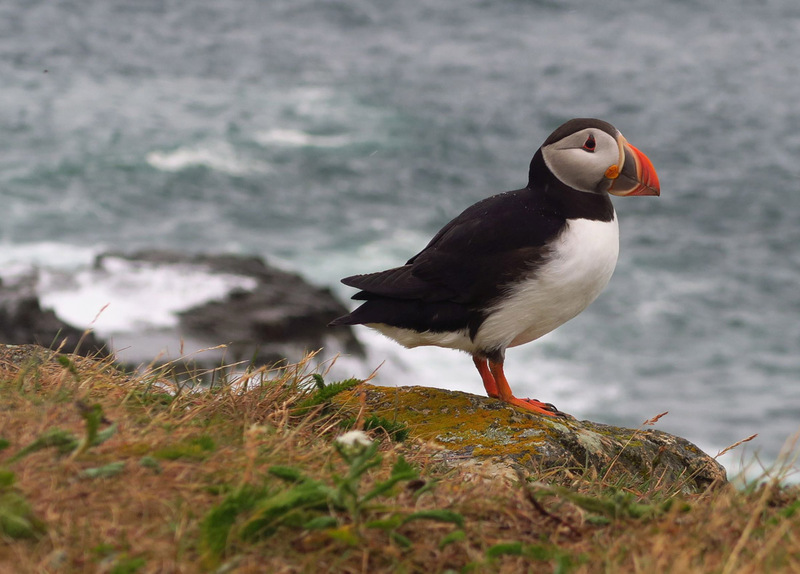 • The Atlantic Puffin is the provincial bird of Newfoundland and Labrador. 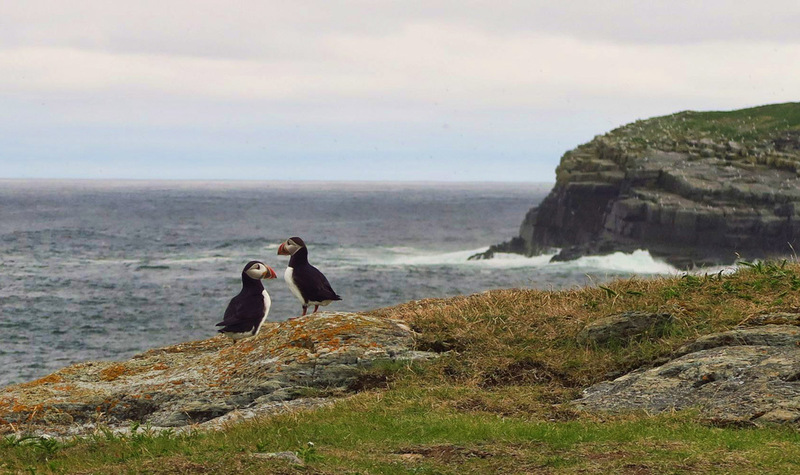 • About 95% of Atlantic Puffins in North America breed around Newfoundland’s coastlines. 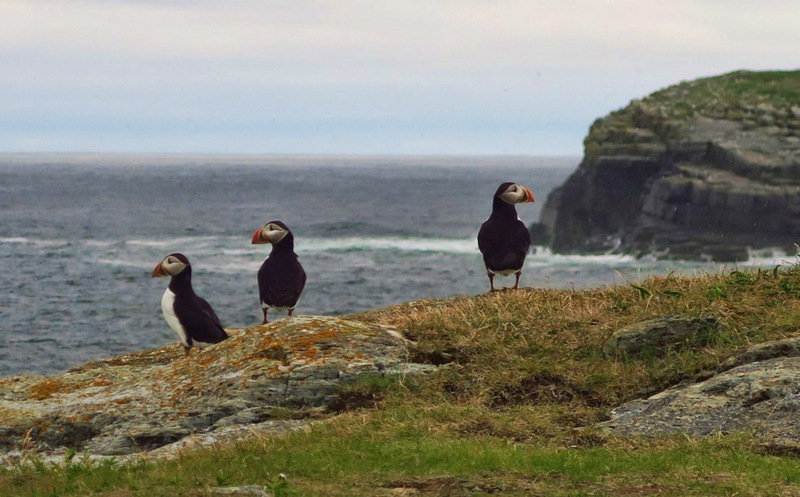 • Year after year, puffins always return to the same island where they were born — they even return to the same burrow and the same mate! • Puffins can carry as many as 22 fish at one time. • Puffins swim better than they fly, and keep their eyes open underwater. 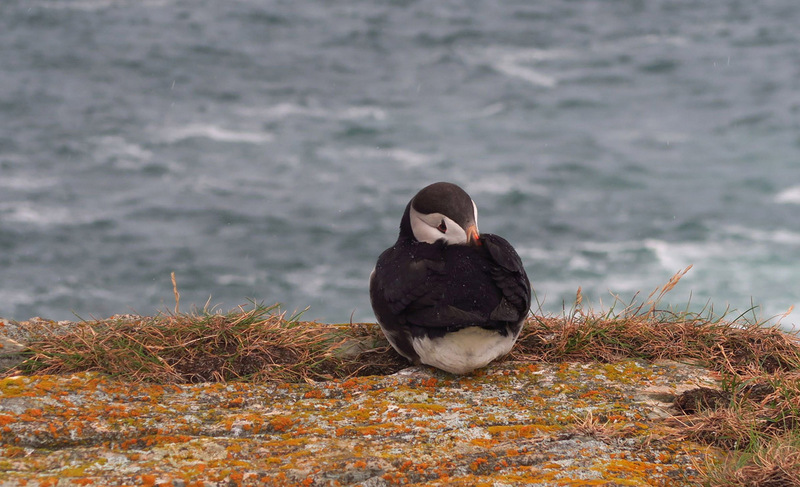 • Puffins do not sit on their eggs like other birds; they have to tuck the egg in close and hug it with their wings to keep it warm. 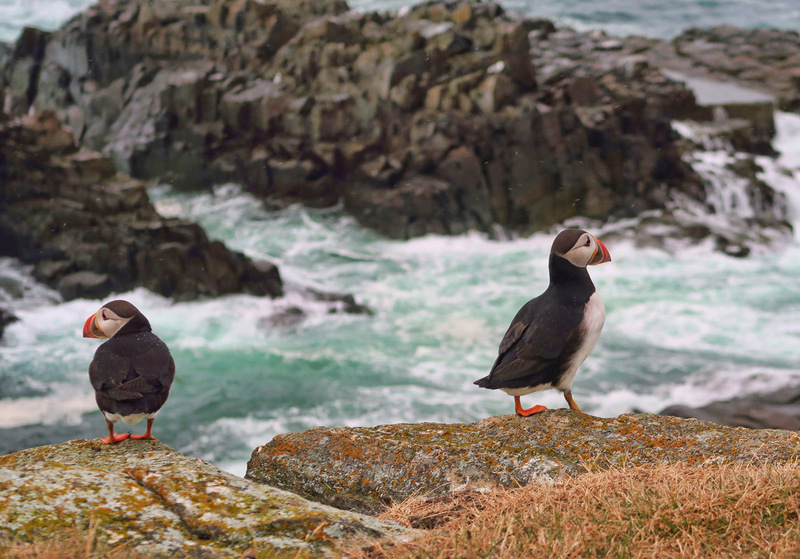 • When the weather gets cold, puffins lose their bright colors — their white feathers turn gray and their orange legs turn dark. 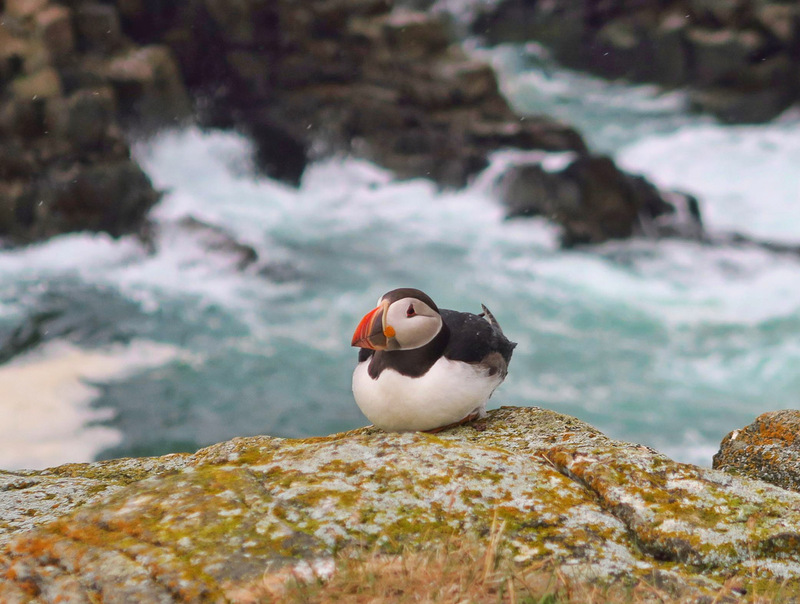 • Puffins spend more time in water than in the air. 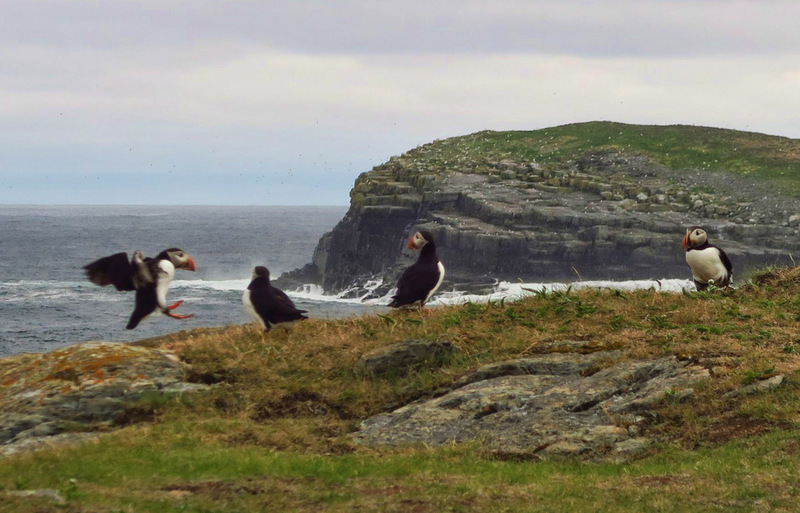 • North Atlantic puffins live in the ocean and return each spring to the island where they were hatched. 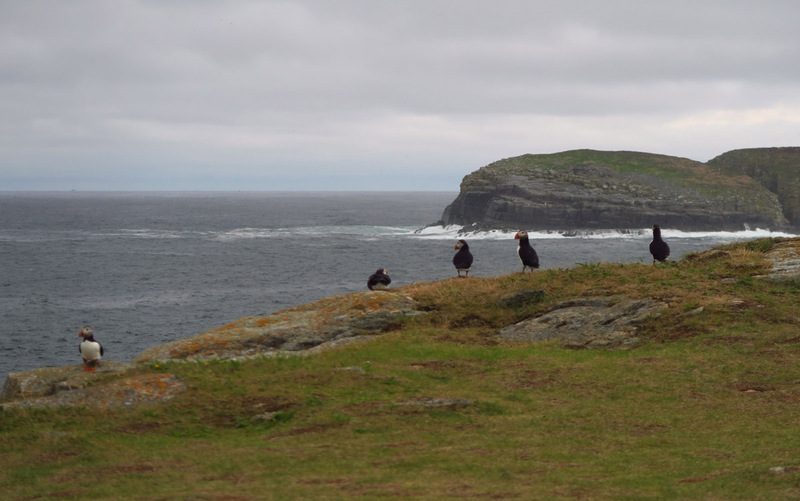 This entry was posted in Canada, Newfoundland and tagged Elliston Puffin Viewing Site, puffins by Suzanne. Bookmark the permalink. Wow! Great job on the puffins! Keep up the good work! Well worth the second trip, eh! Fabulous photos. You come to Canada to see puffins and I travel to the US, Cannon Beach, Oregon to see puffins. Your sightings are 200% better than mine ever were. Triple WOW!!! they are cuties and their eyes are triangular? LOVE! Such unique looking birds, so glad you got your time with them and got to share them with us! 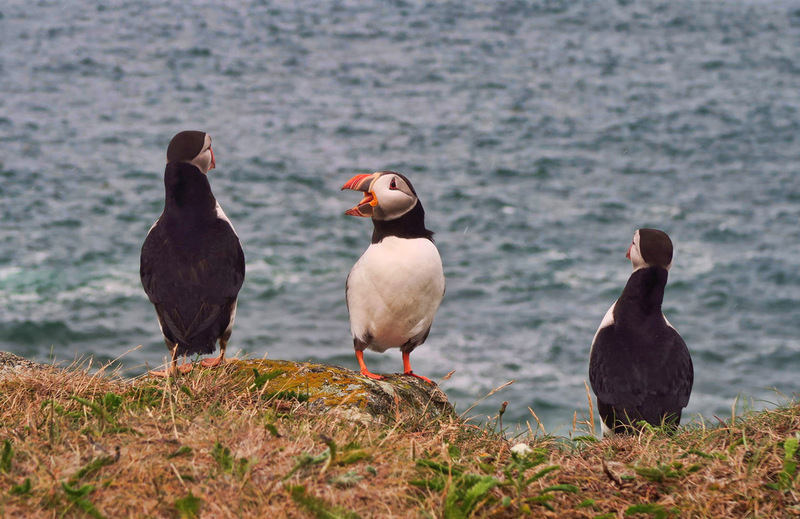 I was oh, so hoping you would return to the puffins. Now, I want to go next year. May I ask what dates you were there? Thanks for taking the time and energy to post for us. You lucky duck! 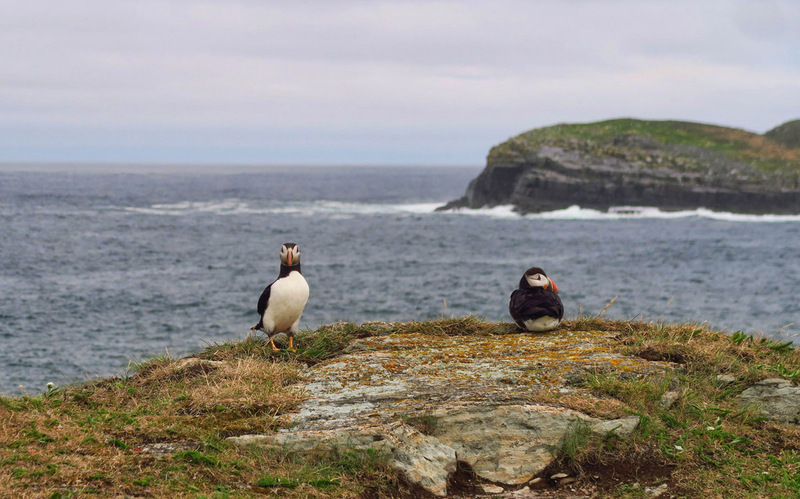 I was scheduled on a boat trip to see the Puffins. But, the weather was too foggy, so the trip was cancelled. 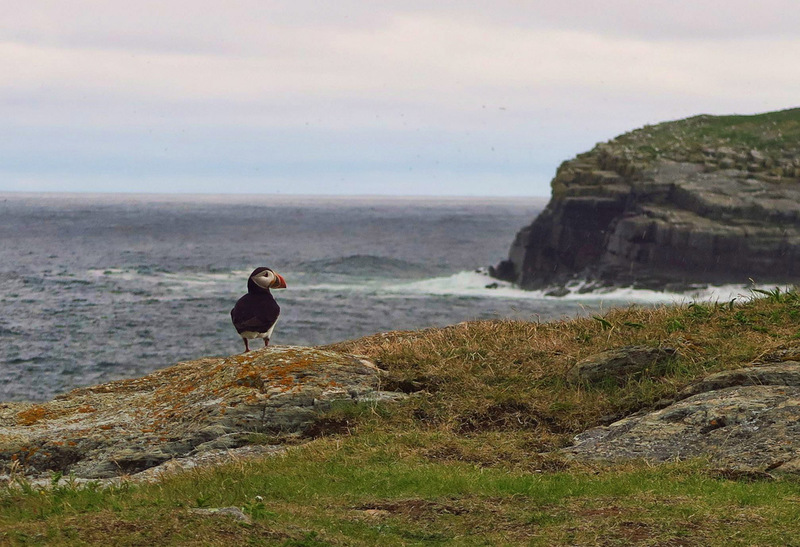 Great photos of the Puffins! Thanks for sharing, Suzanne. 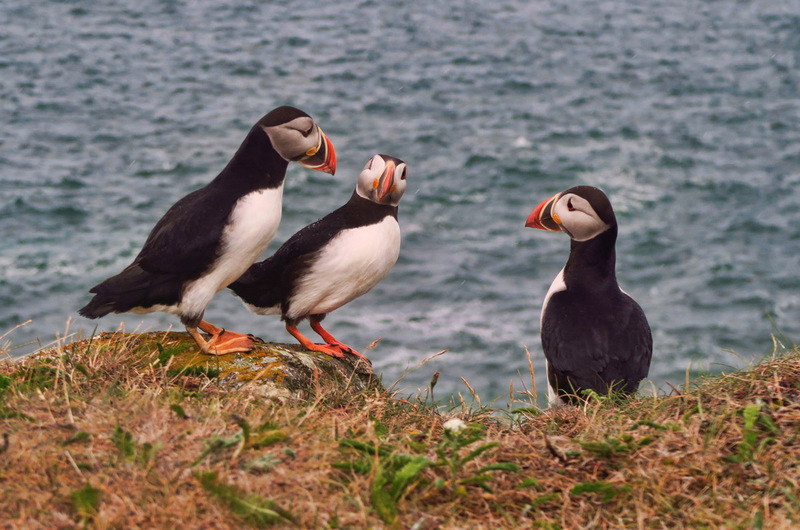 The Puffins ……They are so cute…. This is such a keeper !! 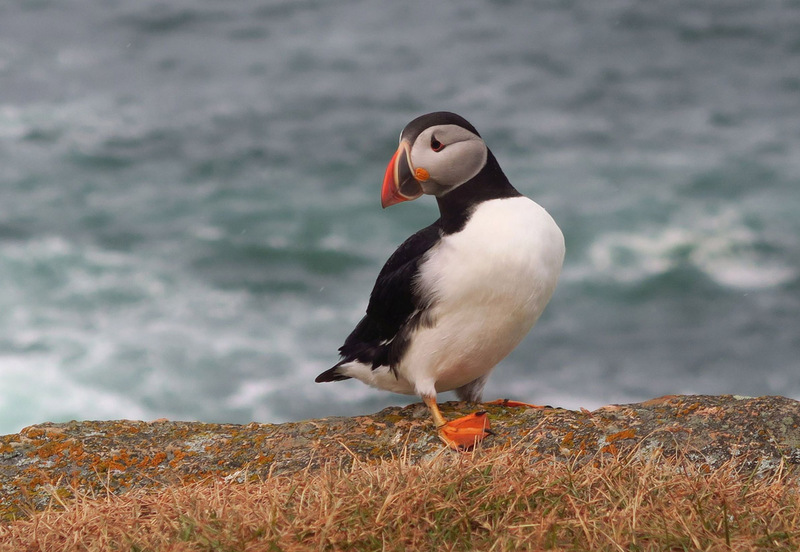 Puffins are cool birds! Nice pictures!! Definitely worth the return trip. Hi, Reta. I couldn’t think of another bird to compare it to, as it’s much smaller than the penguin. So I googled it to learn they are about 10 inches tall, and weigh about the same as a can of soda. Hope your family is doing well. 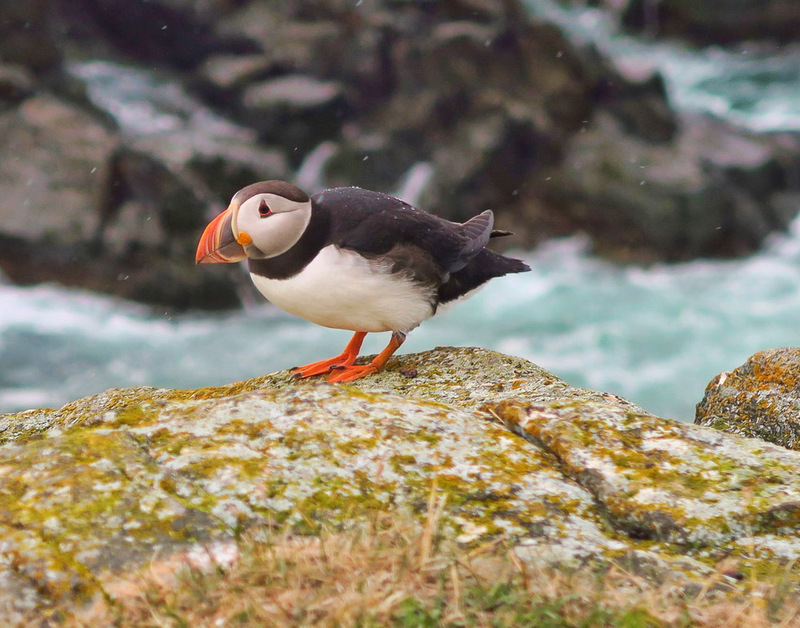 Awesome Puffin pix! Priceless expressions in some of those shots. Perseverance paid off on this one. 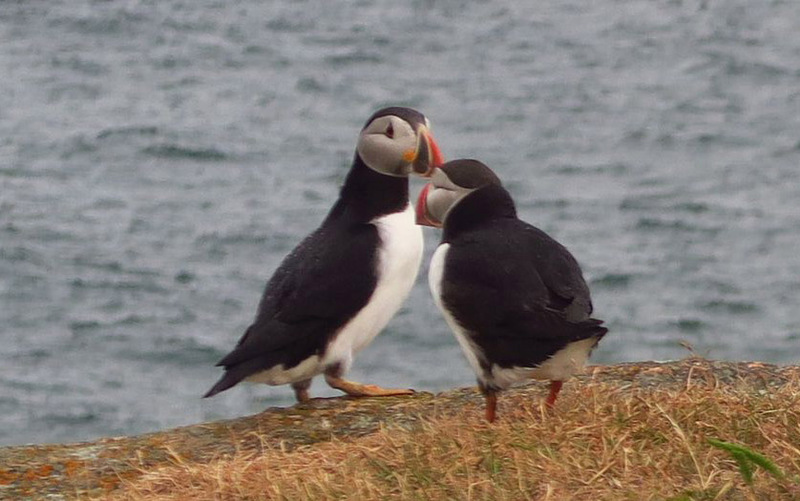 Closest Puffin pix I’ve ever seen. You scored on your stealth mode pictures! Amazing! Suzanne, these are amazing photos!! The puffin don’t look real your shots are so clear. You must have gotten very close to get such clear photos. 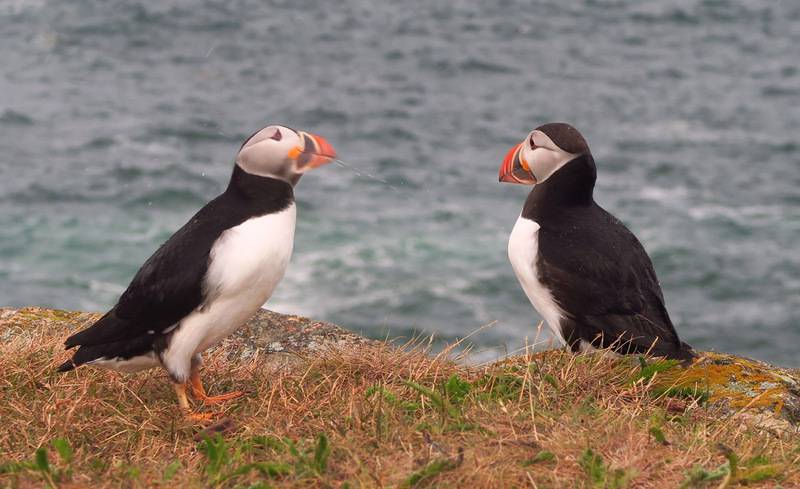 The puffin are adorable:) So glad you went back and waited out the crowd in the dampness. Thanks for sharing!! Suz, best one yet! You know how I love those puffins!! Saw a few in Alaska but not close enough I could tell much about them. These pics are priceless! Love you! 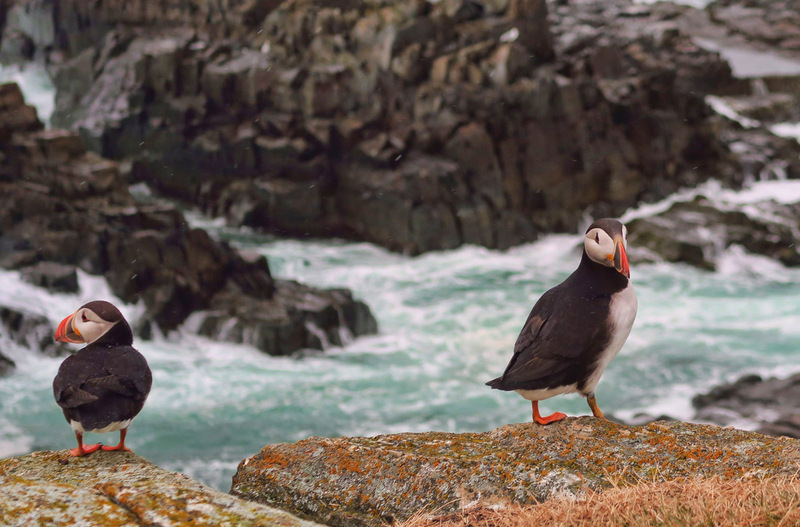 I am so happy you got to see the puffins and take such good photos. Theya re so cute they don’t even look real. I was very disappointed we didn’t see any on the Olympic Peninsula, so now we know where else to look! Thank for the Puffin pictures. I have been following you blog for a long time. First time in leaving a comment on any blog, ever! 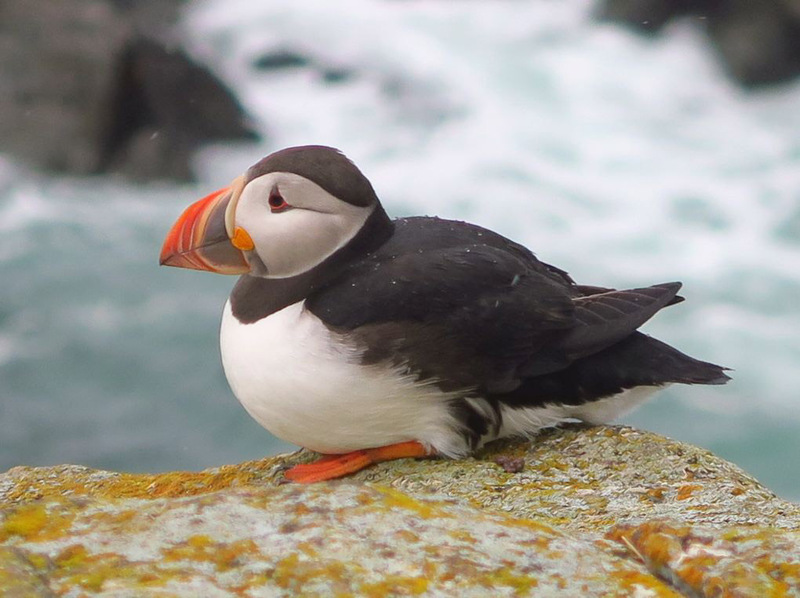 My observation of you Puffin pictures and information you shared about them spending most of the time out in the ocean fishing, makes me wonder if the markings are there so when they go under to catch fish that well, they look like fish. Even the eye markings look like a fin. Thanks again and glad to read your enjoyment of life. Paul, I am delighted that you chose TTTH blog as your first blog comment ever! Thanks for following along, and for saying hello! 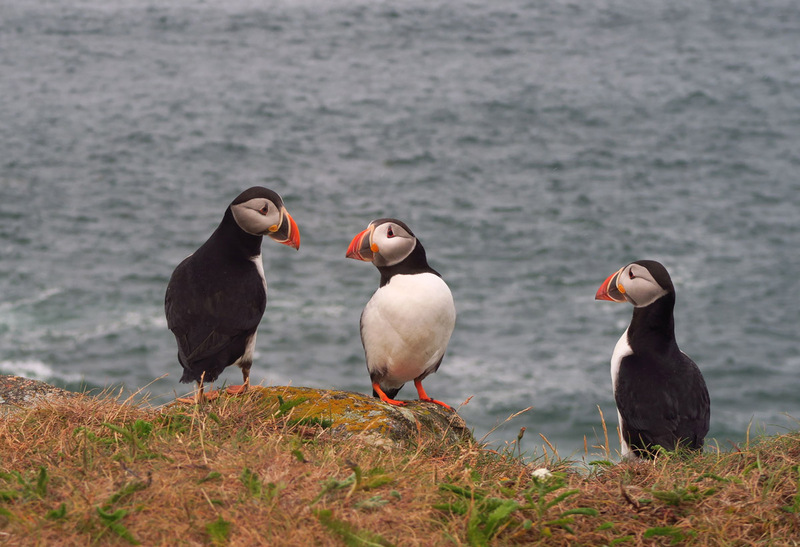 I can remember puffing after trying to get close to the puffins in Maine. Thanks for the great pictures. Breathtaking photos! 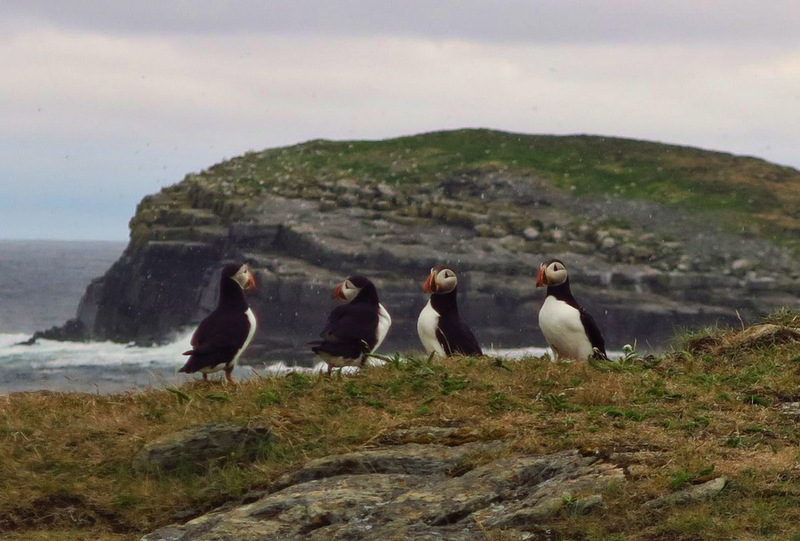 Puffins have long been on my radar, but have had to satisfy that urge with others’ photos. Yours are . . . in a class by themselves. May I download and save them to drool over later? Hi, Judie — I would be honored! Thanks for asking. Hope you and Gary are having a good summer! I have always been fascinated by Puffons….thank you for these great pictures. Magical is an appropriate description. 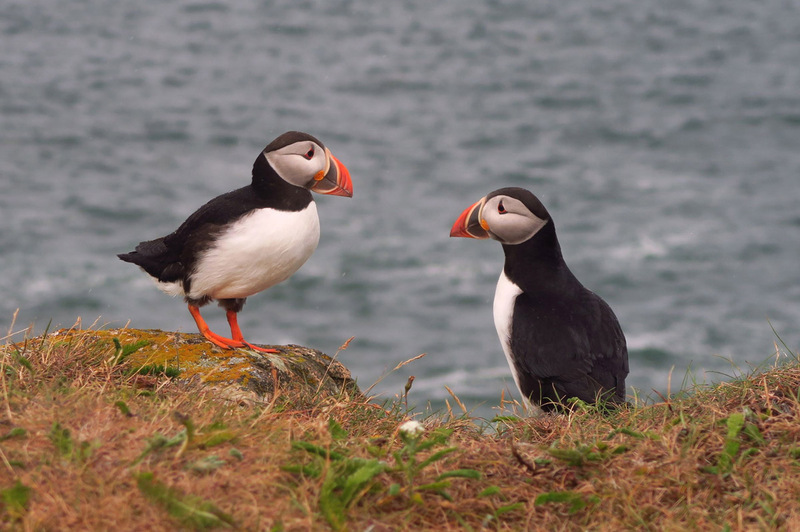 I am so glad you gave the puffins a second chance. Your pictures are great! I’m about to replace my point n shoot camera, what type do you have? Hi, Pam. As I said in a previous comment, your photos on your blog (along with confirmation from friends Ed and Marti) are what inspired me to try again!! The Canon G7X is my only camera. I really like it a lot, but the zoom quality in low light is my only complaint. Of course, that could be because I never take it off the “Idiot Setting!” Thanks for following along, and thanks again for all your tips! Absolutely stunning! I am so envious Suzanne. What a magical moment that must have been. Truly jealous here, somehow you got better pictures with your point and shoot than I did with my rented 400mm lens! Love that shot of the one spitting, and yes, it is a magical place to visit and one I look forward to visiting again.